In 1990, a school exercise was put in front of me that carried the words: “Today we live in a multicultural society”, and I wondered where it came from and how it sneaked its way into the mainstream, with the majority of the population apparently accepting it with little resistance. It would be another decade or two before it dawned on me that this was simply what everyone was being told and not necessarily what was true. 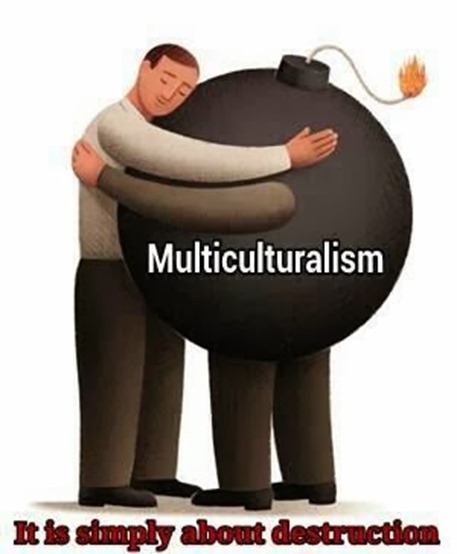 Surely, to live in a multicultural society, everyone has to get along well and be reasonably happy about it, right? But the evidence around me was pointing in another direction. Then one day I learned of something that happened in the general election of 1964. The residents of a place called Smethwick were getting pretty fed up with excessive immigration and voted in a Conservative MP who had pledged to support them. To be fair, the win was pretty narrow and the seat was re-taken by Labour in another election shortly after. But what it told me was that multiculturalism was something that had, albeit in the past, been thrust upon us. Is this really an acceptable situation in a society that calls itself democratic? This does sound like a gross disrespect of peoples’ wishes. Since 2002, schools have been teaching citizenship classes. The supposed goal of these classes is to provide a generation of well-rounded individuals who can make positive contributions to society. I’m fairly sure I included the right amount of meaningless buzz-words there. This is all well and good, but my digging is making me wonder whether they are actually a conduit of government indoctrination. Seriously, this sort of thing goes on in North Korea, but at least their government admits it. Here, in the UK, our government seems more given to say that it’s for our own good and we seem more content to swallow this sort of brainwashing, sometimes to the point of defending it. It seems that the goal here is to effect conformity and obedience, rather than education, so that future generations blindly support the government’s agenda. I have, for some time, seen teachers as little more than the extremities of the civil service; the hands of the government itself, if you will. And these hands are currently tasked with effecting a politically correct agenda, where “correct” is, of course, a point of view. Perhaps if we didn’t have such a problem with political correctness, we wouldn’t have such a problem with immigration. One could argue that attitudes are shifting, but this does not sit well with me. I think it’s more political than that. Both sides of the political argument have reason to effect high immigration. The left like immigration because it dilutes patriotism. More immigrants leads to a lower percentage of the native population, which translates to fewer people voting against it and more in favour of the party that welcomed them. The right, on the other hand, like immigration because it lowers the wage bill – assuming most of the newcomers are willing to work for low pay. And this is my beef. I’m all for competition, but this is getting extreme. I work very hard, but my hard work has got me no pay rises in the last four or five years. That equates to an effective pay cut if you factor in inflation. Therefore I’m working as hard as I can to stay exactly where I am. So I would appreciate it if whoever is in power could kindly reign in immigration. Failing that, I’d settle for those present to stop undercutting me because, you know what, I need pay rises not just to keep on top of expenses, but to raise my standard of living as well. Yes, that’s right, I want some extra cash for myself. But as things stand, the government has made it very difficult for me to settle down and start a family and it has replaced the kids, I’ve not been able to have, with immigrants. So unlike the current doctrine, I do not believe “this country needs immigration”, because, for every immigrant that sets foot on our soil, the chances of me being able to continue my own flesh and blood decreases. Immigration also changes the character of an area. We can celebrate “diversity” all you like, but it’s not much good if “diversity” means not “every culture represented” but instead “every culture represented apart from mine”. This is not an exaggeration. There is a school, not far from me, which, aside from being proud of having an excessive number of languages under its roof, is also proud of representing every religion apart from Christianity. Like I said – every culture apart from mine. Why should I be content to live in the shadow of such bigotry? I could move out of London of course, but why should I? I was born here and I call this place my home. But I didn’t ask for ethnic groups to swarm the place and lord it over the high streets, making it too intimidating for me to walk into certain areas and then have the audacity to call me a racist for either pointing it out or questioning it. Or should I just walk through as though nothing is wrong? There is no such thing as racism when it comes to my personal safety. As well as showing disdain for our way of life, immigration crowds this country. We are a relatively small island and have limited land area. Our infrastructure can only take so much. By having unchecked immigration, we swamp our own ability to keep pace. People need houses, roads, supermarkets, doctors, etc, but we can’t build these things quickly enough to keep up with the demand. I’m not going to get into a digression on how this pushes up house prices, but I am going to point out that it’s getting a bit wearing having to wait so long to get a GP appointment because their books are so full and that the three people in front of me have decided to let the surgery know they’re cancelling their appointments, not by phoning ahead a few days in advance, but by simply not showing up on the day. Don’t get me wrong, I salute them for clearly being able to live like divas, but I have to take half a day off work just to be there, from a job that I keep, not, it seems, to advance my own standard of living, but to pay for theirs. So show some consideration. On some level, I do take it as a compliment that anyone would want to come to the UK to improve their way of life, but please, not at the expense of mine. We are not a charity for the rest of the planet. I was here first and see no reason why I shouldn’t get either the lion’s share of the spoils of living here or why I should be second in line to get it. 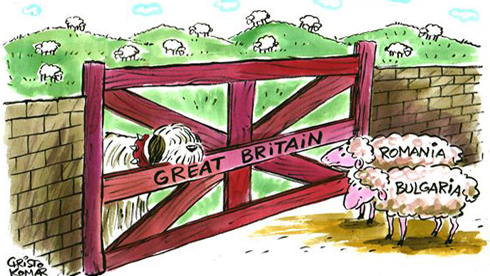 But rather than be self-limiting, this starts to spill over into a disdain for British culture. Rather than integrate, as we are told to do with them, they form their own communities and disrespect our laws and culture. By disrespecting our laws, I refer to activities such as fly tipping (to name one). Why would I want to see a discarded TV or sofa on the street in my suburb? I had to opportunity to ask about this when I was once in an eastern European household. The answer was, and I quote: “in case someone else wants to take it”. No! You can’t do that. You can’t turn up in someone else’s country and impose your sensibilities. When in Rome, do as the Romans. Again, this isn’t racism, it’s common decency. And on a practical level, you’d have to be pretty desperate to want a TV or sofa that’s been sitting in British weather for a week. Call the council to collect it, or take it to the tip in one of those expensive cars that you mysteriously seem to be able to afford. Actually, while you’re at it, and I’m being really serious here, grab a copy of the Highway Code and damn well read it. I have had just about enough of you bringing your aggressive driving techniques to our shores. Not only does it scare the hell out of me, it borders on dangerous and is most certainly illegal. Just over a decade ago, it was a pleasure to drive. Now it’s so cut and thrust, I think twice before driving around even my own neighbourhood. Stop overtaking me on the inside, be a little more patient and please drive significantly more than 2cm away from my rear bumper. In the 1990s there was a campaign aimed at forcing the native population to accept immigration. 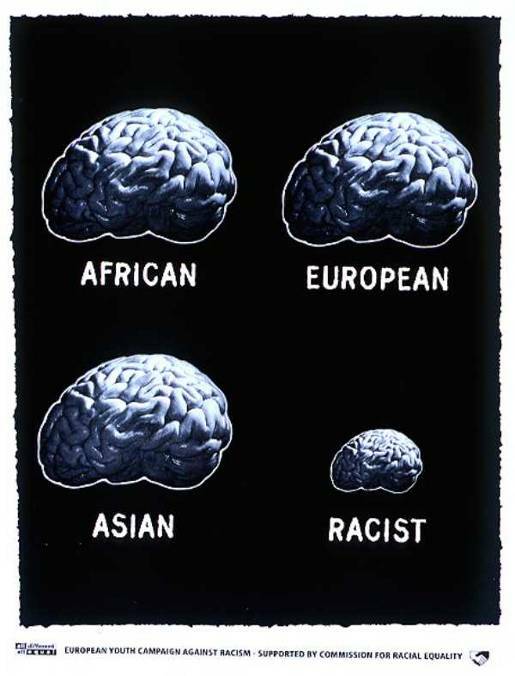 I’m referring to a certain poster that depicted four brains. Three of them were of equal size. The fourth was of smaller size and was labelled “racist”. I guess the surface-level message there was that, if you’re a racist, you’re narrow-minded. But the effect it had on me was really just to leave me feeling accused; as though I’m just a closet or undiscovered racist, who should just keep quiet and accept the status quo. I just have to keep my mouth shut, or be shouted down (or shut down). Now, even kids at school can get a record for a playground slur. How is that fair treatment of the native population, particularly from such a young age? I’m glad I never got caught out of all that. Well my reaction to that is to say that it’s fine for the political elite to endorse such campaigns; they don’t have to live in these ‘diverse’ and ‘progressive’ communities. They live on another plane and seem to be largely unaware of what ‘diversity’ means on the ground. Having a school with 30 languages under its roof is not an achievement. What good is it if you can’t learn our history, or grasp advanced mathematics because you’re distracted by having to learn how to say ‘hello’ in Urdu? Actually, I just remembered that, in the late 1990s, possibly around 2000, there was a TV advertising campaign about milk. It featured a very British backing tune and ended with a shot of a pint of milk and the slogan: “The white stuff. Are you made of it?”. There were also billboard advertisements to the same effect. I thought, and still do, that this was some kind of tester to see if anyone would cry foul. To my knowledge, no-one did. Admittedly, I’m not sure what ultimately became of that campaign. But I don’t think any of the indigenous population rose to the occasion and I’m wondering if this was taken, by the establishment, to be a vote of confidence for immigration. But it was probably a bit too subtle for anyone to see it as some sort of call to arms. So now what situation do we have? There is a large section of disconnected and ignored indigenous Britons who don’t feel any political party speaks for them, particularly since it was the Labour party who opened the door so wide and that the Conservatives have basically copied them because they’re still so in awe of Labour’s 1997 victory after moving from left to centre. So we have two virtually identical mainstream parties. Since nature abhors a vacuum, that leaves the prospect of a new party forming and occupying the space that has been vacated. The left looks pretty crowded right now, with elements of Labour, SNP, Greens and elements (or remains) of the LibDems. The centre is occupied by elements of Labour and most of the Conservatives. So who is on the right? It seems UKIP is about all there is to go for. They won’t get in (or indeed secure many seats), but they’ll get a good share of the vote. This will leave us with a problem. With so much share of the vote and so few seats to show for it, thanks to our First Past The Post voting system, some may start to feel there isn’t any real representation for their views. And soon, without representation, we could end up seeing a radicalised movement of indigenous Britons, seeking to address the unanswered mandate from Westminster. You see, those who care about immigration don’t want the problem sorted out in five years’ time, they want it sorted out now and Westminster is playing a dangerous game, highlighting the contempt they have for our democratic right to representation. What I’m communicating is a viewpoint and that viewpoint has just as much right to be heard as the Green party’s right to spell out the top 5 methods for hugging a tree. With all the bloat we hear from a party as left as the Greens about how they champion “tolerance” and their beloved “diversity”, I don’t see much tolerance for my views. It’s the left that shuts people like me down, as much as they claim to be “inclusive”. I wonder who the hypocrites are. Furthermore, with an Australian leader, the Greens curiously don’t have much time to discuss the possibility of an Australian-style points based immigration system in the UK. I think this is what’s known as irony. Oh, and hypocrisy. So now I’ve had my say. And, while I suspect most people will silently agree with me on many of the points I’ve raised, there will be some; and there are always some; who will call me all manner of names for having an opinion. These insecure types don’t like people to hold opinions; they’d rather I simply be quiet and obedient. But I will not. I will continue to raise issues, as I believe it is my right to do so. So if you want to call me a racist, go right ahead, because it does not shut down the debate. It simply emboldens me to continue. And it’s very politically incorrect to call me a racist, because the correct term is “ethnically concerned”. This entry was posted in Democracy, Diversity, election, EU, Europe, Great Britain, Immigration, Libertarianism, Politicians, Politics, Progressive Politics, Racism, social, Tolerance, uk, uk government and tagged Britain, Campaigns and Elections, Conservative, Democracy, Diversity, election, eu, europe, Government, Great Britain, immigration, Politics, Progressive Politics, Racism, Tolerance. Bookmark the permalink. There are several types of immigrants as you do doubt know. The ones coming from the EU are doing so based on the most fundamental principle of freedom of movement of people and goods within the union. That’s the same principle that allows elderly Britons to retire in Spain. There sure are drawbacks and maybe some adjustments like limiting access to social benefits are needed. Tamper with the basic principle and you will have to take back millions of pensionados. And I doubt Scotland and Wales will want to join Brexit, so you would have to apply for a visa to visit the highlands. It’s a package deal you see. I do acknowledge your concerns and you raise many relevant questions. But it’s a complex issue and your post would gain if you address that complexity. A very valid point, no argument there. Admittedly I wrote this post with the idea of “how immigration affects me personally” in mind but I tried to include as many aspects of this complex issue as possible. It was only after I started writing that I realised how complex it really was. My research didn’t reveal your point to me and it seems that, when researching from a UK perspective, the topic of immigration is presented in a (mostly) one-sided fashion. Perhaps this is a failing of our media – wouldn’t be the first time. But surely retiring to a foreign country, EU or not, would still be possible after an EU exit? I’m certainly aware of retirees living well outside the EU today. But retiring in general is something that scares the hell out of me because, even with a pretty good job and pensions set up, there’s no way I can afford to live like the current retired generation. I was planning to address the generational differences in a future post – so I’ll try to tie your point into that. Point well made, sir. Of course it will be possible, just like working elsewhere. But it will not be easy, surely much more difficult than nowadays. And I think that if Scotland will split from the UK in case of Brexit, other parts will follow suit. Imagine what will this mean for Northern Ireland, if the Irish nationalists will see their chance and want to join the motherland? I doubt UKIP tells that part of the story. Looking forward to read your next post on the topic. I thought Scotland was going to vote for independence in their referendum and that, if it had been a ‘yes’, it would have been the beginning of the end at -that- point. I admit I hadn’t given much thought to a Brexit triggering a UK break-up. It sounds like it’s worth reading up on. I was considering posting on the prospect of a second Scottish referendum, but was going to wait until after the election (no point doing it before). You’ve given me a couple of things to mull over.